My book 'Smudging the Air' has been added to Amazon US, UK and Europe today. There is no delivery date yet but they are taking orders. If anybody reads it, please let us all know on here or on Amazon what you think of it. I have tried very hard to describe what is special about the lyrics. Teresa Quayle. It was great to learn that also the "Darker" songs are included! Teresa told me that she worked hard over the last few weeks to incorporate the album. Looks very promising, just bought my copy at Amazon. Just bought my copy too! Can't wait to read it!! Thanks for ordering. I am delighted that the book is going to Beijing!! I've just received my copy of “Smudging the Air” and I am looking forward to delving into it!! I became interested in Leonard's songs back in the 60's after buying “Songs from a Room” but a busy career, house purchase and other interests meant that after buying “Songs of Leonard Cohen” and “Songs of Love and Hate” Leonard unfortunately slipped off my radar. I occasionally played CD versions of my albums and puzzled over the meaning of the lyrics but that was it. However some two years ago I rediscovered an interest in my vinyl collection and put together a suitable Hifi system, with a turntable. I began playing Leonard again and wondering what became of him. Quite recently I was delighted to find, and purchase, the “Complete Studio Albums Collection” box set and soon realised I had missed out on a massive amount of his work. After hearing some of his later songs the fascination was rekindled!! After some research I bought “The Lyrics of Leonard Cohen” and “I'm Your Man” by Sylvie Simmons, which I am now halfway through. By chance I stumbled across “Smudging the Air” and I am hoping that it will help me clarify my own thoughts about the meanings of his lyrics. 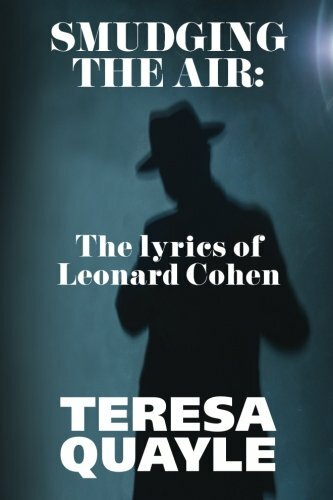 My initial impression of the book is that the fusion of Teresa's data analysis of the lyrics, together with her understanding of English language and literature will provide a unique source of reference material for those interested in Leonard's songs and music. Before taking my time getting to know his songs better, with the help of Teresa's book, I am planning on completing “I'm Your Man” to get a better understanding of how Leonard's life panned out to in order to help me put his songs in context. I read quite a bit of it on amazon and it does look like the author has done a beautiful job. Thanks, Vikki. I really hoped that people would enjoy it. Doron B Cohen has written an in-depth review of the book for The Files. Thanks, Jarkko, for posting my review on the Files. The bottom line: I found Teresa Quayle’s book to be valuable and interesting in some respect, but I also could not help criticizing various aspects of it. This is a somewhat strange case when a reviewer (this one, at least) can’t give a simple answer to the question: Do you recommend this book? If you read the review you’ll understand my reservations, but I also think that people with deep interest in LC’s work may find in the book some valuable insights. Thanks for the constructive review, Doron. I have tried to look at the lyrics in a different way, so it is inevitable that some people do not entirely agree with my approach. Some of your points reinforce my view that the magic of these lyrics lies in people's personal interpretation. You certainly make many very valid points. I never thought of myself as a cottage industry - I would have loved to have an agent and a publisher but they are very hard to come by for a first-time writer. I bought this book. I agree with Doran : people may find in this book some valuable insights. In my opinion : "DEATH" is certainly a regular subject area in Leonard' s songs. I missed it in Teresa's book. "Dance me to the end of love ? .... " I should also put the Abbreviation D.